I don’t know about you, but I’m not ready to say good bye to peaches just yet. What do you do when you’re not ready to say good bye? You preserve the harvest. Today I’m going to show you how to freeze peaches. 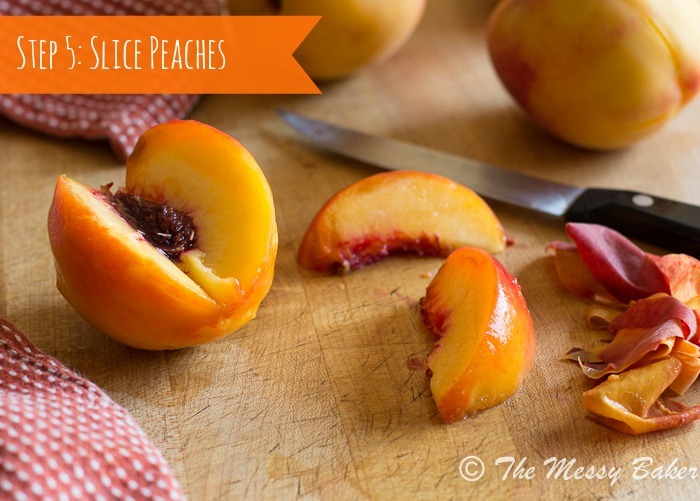 There are several ways to preserve peaches, but I find freezing them to be the easiest. Freezing peaches takes a bit of technique. You can’t just slice them and stuff them in a freezer bag. Well, you can, but what you’ll end up with is a hunk of frozen peaches. Not very appealing, right? If you just throw the peaches in a bag all willy nilly, the sugars in the peaches will start to macerate, causing the peaches to freeze together in one gigantic peach cluster. After a while, the extra juice that the peaches produced from macerating will start to form ice crystals, which will drastically reduce the shelf life of your peaches. In the end, you’ll need an ice pick just to eat your frozen peaches. 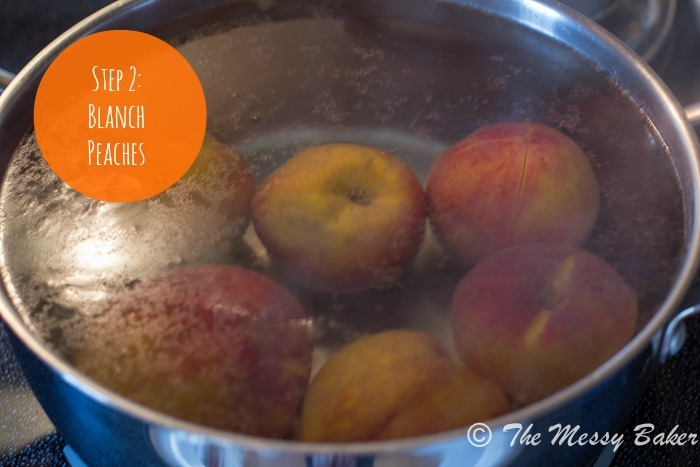 Blanch the peaches in boiling water for 20-30 seconds–no longer. 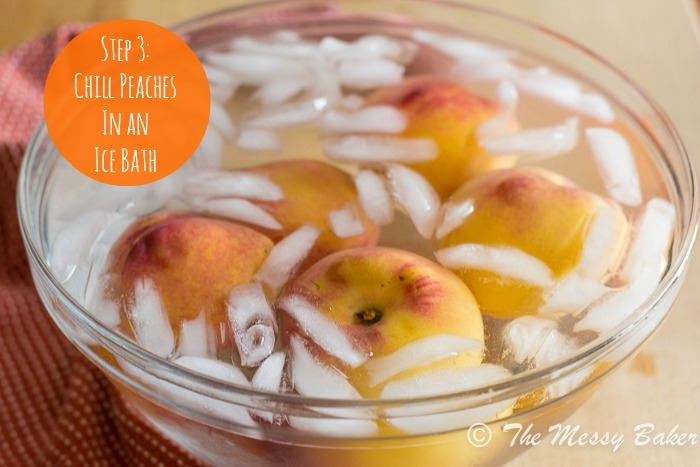 Remove the peaches from the boiling water with tongs and transfer them to an ice bath. Allow them to chill in the ice bath for 20 seconds. 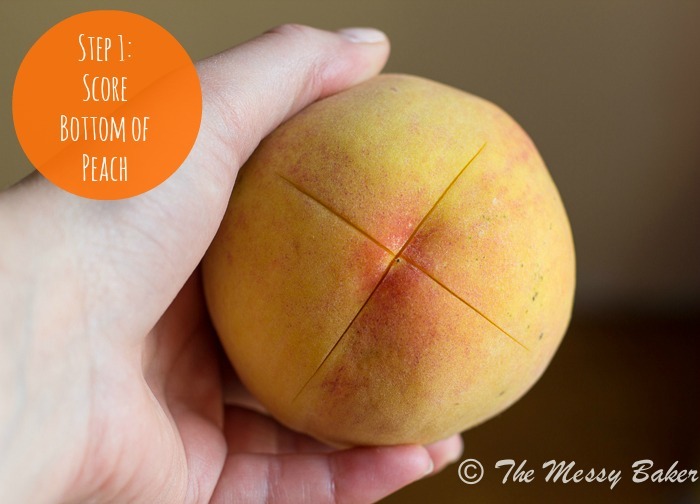 Using your fingers, remove the skin from the peaches. 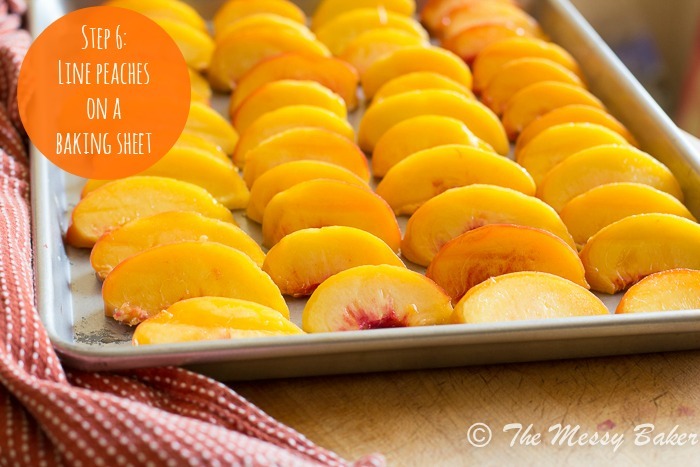 Line the peaches in a single layer on a baking sheet. Allow the peaches to freeze completely, about 2 hours. 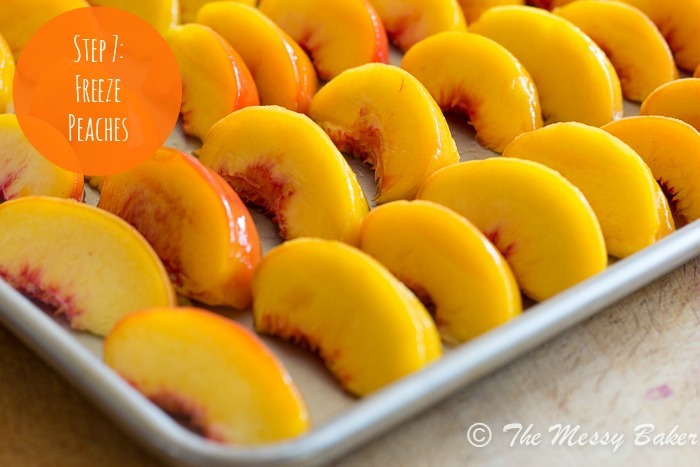 The peaches will adhere to pan during the freezing process. Use a spatula to loosen them from the bottom of the baking sheet. 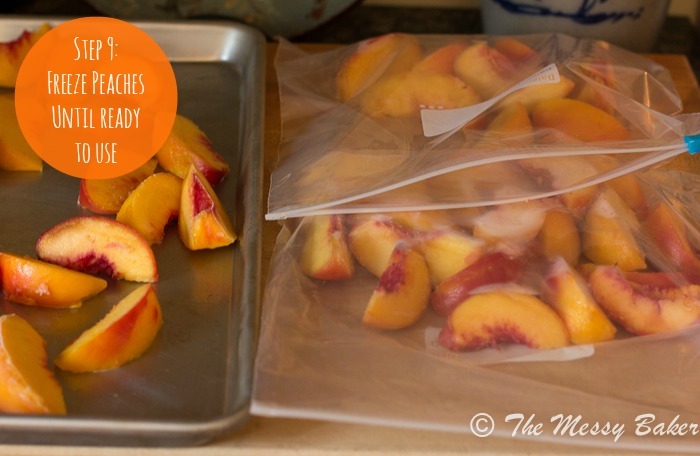 Place the peach slices in labeled/dated freezer bags. The peaches will stay fresh in the freezer for up to 3 months. 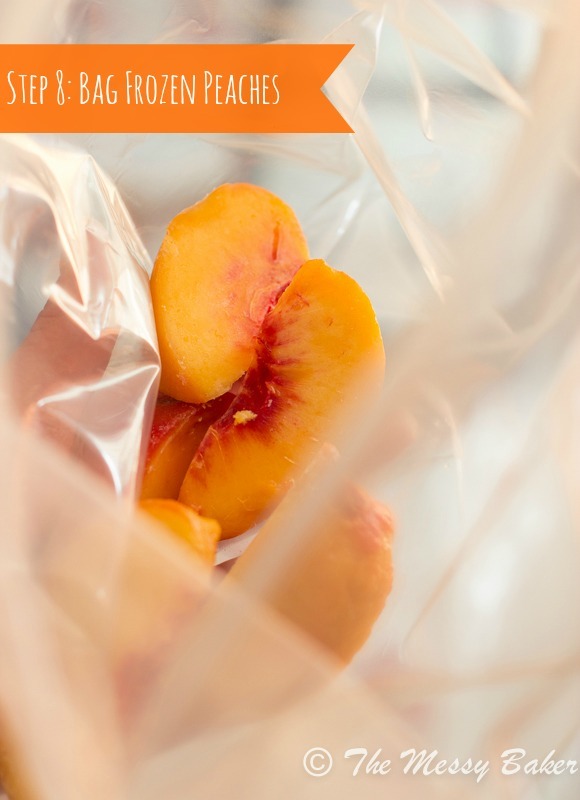 This method of preserving will allow you to pull a few peaches out at a time or use the entire the bag. While the peaches will taste just as sweet as the day you preserved them, the integrity of the peaches will be a little different. Their texture is a bit softer after than a fresh peach. 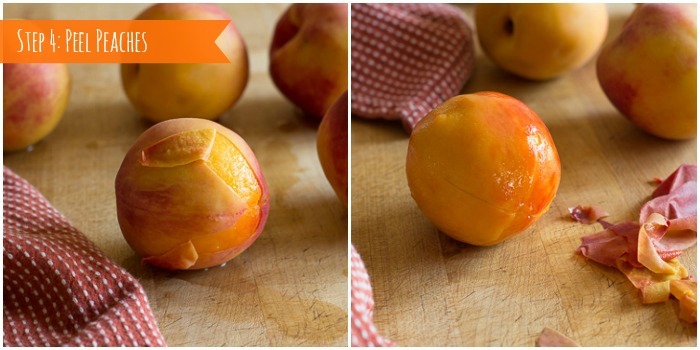 The best way to defrost the peaches is in the refrigerator. Although, there are many uses for a frozen peach. I happen to love them in smoothies. This is just the first of several how-to tutorials. If you would like to see something specific, please feel free to leave me a comment. Ha ha. If only they would survive the haul. I have been doing this with peaches and nectarines, I want them for the cold winter in my smoothies!! Yeah, smoothies! It really is a great preserving method. Great tips! Love it. I am not ready for fruit season to end either! Thanks, Stef! I’m not either. The heat, however, can disappear. I think I better start pumping out more peaches. You’re the third one to request a peach delivery. They really hold up well in the freezer. I can’t wait to eat peaches in January. oh no: we’re going to have to purchase an EXTRA FREEZER now. I can’t know how to make frozen peaches, Jennie! I WILL FREEZE ALL THE PEACHES!! Thanks, Anita! Too short, indeed. I’m hoping to move south soon, preferably the Carolinas. Thanks, Terra!